Lady Bird Johnson, former first lady of the United States, was ahead of her time in understanding the reparative and regenerative qualities of native plants and beautiful landscapes. In 1982, Mrs. Johnson wrote that she was full of excitement about finally “daring to try to establish a National Wildflower Research Center.” In that year, she and actress Helen Hayes decided to do just that, creating a center in East Austin focused on native wildflowers intended to help preserve and restore that beauty and the biological richness of North America. Helen Hayes and Lady Bird Johnson at a press conference announcing the creation of the Wildflower Center on May 5, 1982. Public demand to view native gardens and learn more about native plants soon overwhelmed the original 60-acre site in East Austin, and led the Center’s Board of Directors to build a larger campus to accommodate public interest. The current campus, renamed the Lady Bird Johnson Wildflower Center in 1997, opened in 1995 on a 42-acre site in Southwest Austin, nine miles from downtown. Five acres of native plant gardens and landscapes, designed by J. Robert Anderson, FASLA (principal), Eleanor McKinney (EMLA) and Darrel Morrison (FASLA), were installed throughout a complex of award-winning buildings designed by Overland Partners to reflect the land and regional architecture of the Texas Hill Country. By 2002, in response to rapidly encroaching land development, the Center had acquired an additional 237 acres of adjacent land through purchase and donation. This expansion of the campus made possible the development of larger scale research on the ecology of the Central Texas region and how best to restore healthy landscapes in the region. It also established education and public outreach as core functions of the Center. In 2006, the Wildflower Center, then a 501(c)3 nonprofit organization, was transferred to The University of Texas at Austin. Throughout its history, the Center has become one of the country’s most credible research institutions and effective advocates for native plants. 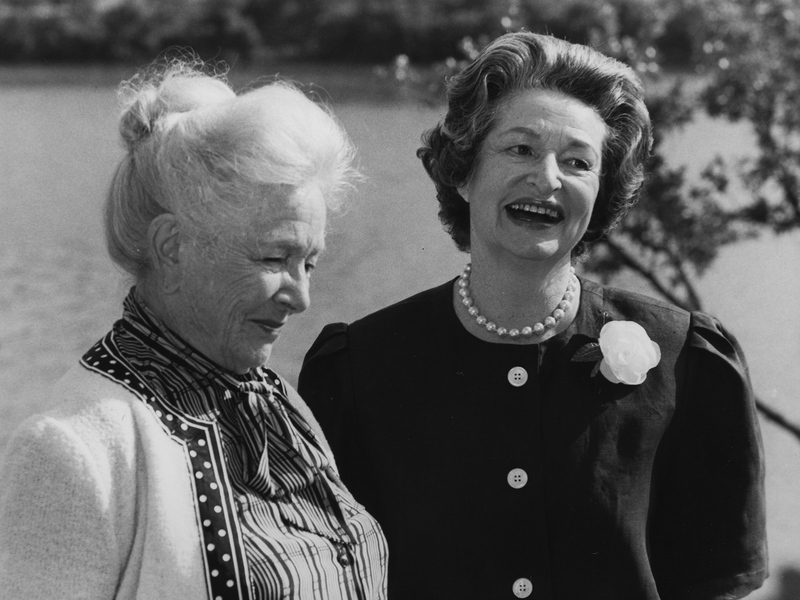 Founders Lady Bird Johnson and actress Helen Hayes establish the National Wildflower Research Center. The Wildflower Center’s formal charter was signed on October 21, 1982. A small house and sixty acres of undeveloped land in East Austin became its first home on Mrs. Johnson’s 70th birthday, December 22, 1982. The Center celebrates the grand opening of its new site at La Crosse Avenue, which was initially 42 acres (it is now 284 acres). The design was a model of “total resource conservation” and emphasizes the importance of native landscapes. It received a number of environmental and architectural awards and was featured on the cover of Architecture magazine. 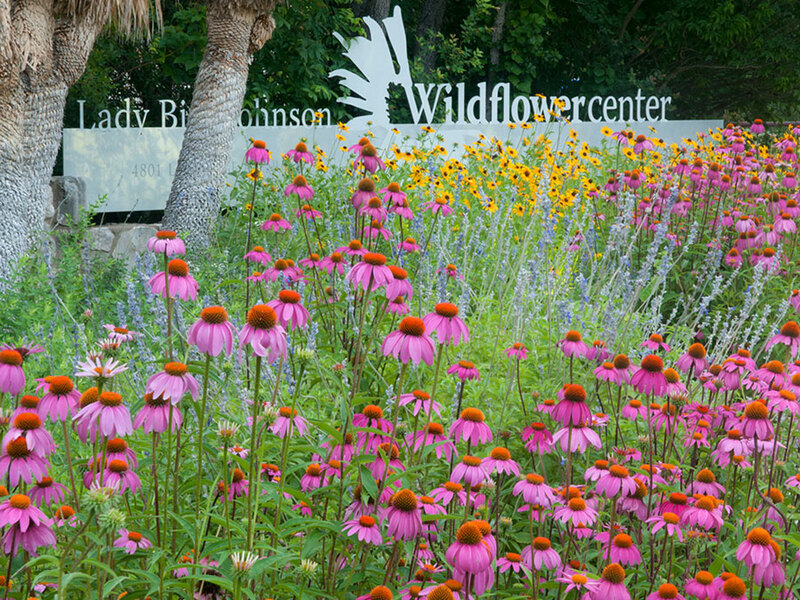 The National Wildflower Research Center is officially renamed the Lady Bird Johnson Wildflower Center. Lady Bird Johnson at the Wildflower Center in May 1995. The Wildflower Center acquires an additional 137 acres, making possible the development of its Landscape Restoration Program. The program researches how to best manage and design native landscapes. 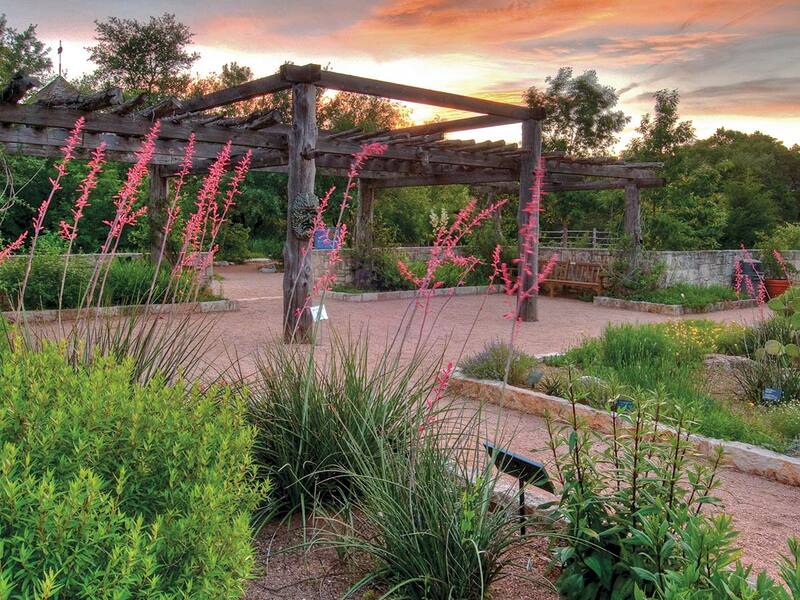 The Wildflower Center launches its Plant Conservation Program and becomes a participating institution in the Center for Plant Conservation, a national coalition dedicated to conserving and restoring the rare native plants of the United States. An agreement between the City of Austin, Stratus Properties (a local developer) and the Wildflower Center culminates in the donation of 105 acres of adjacent land, bringing the Wildflower Center’s total acreage to its current 284. The Native Plant Information Network is launched, offering information on North American plants online. The Wildflower Center joins The University of Texas at Austin. The 16-acre Mollie Steves Zachry Texas Arboretum opens and work begins to plant collections of Texas native trees, including the Hall of Texas Heroes, a collection of famous oak trees of Texas. The 4.5-acre Luci and Ian Family Garden opens, bringing nature play opportunities to families in the Center’s first certified sustainable garden. The Center-led effort known as the Sustainable Sites Initiative (SITES®) — a collaboration with the U.S. Botanic Garden and the American Society of Landscape Architects — is sold to Green Business Certification Inc. SITES is the world’s premier sustainable landscape rating system. The Center received the honorary designation by the Texas Legislature as the State Botanic Garden and Arboretum, recognizing the organization’s importance in protecting the state’s cultural and natural heritage.